You’ve probably heard the adage, ‘You are what you eat.’ Well, this applies to how our dietary habits either make us sick or well. The same goes for how the foods a man eats can determine how well he can sustain libido. On its own, the shape of bananas is libido-inspiring. Better still, banana contains an enzyme known as bromelain, which is believed to increase libido and reverse impotence in men. Additionally, they are good sources of potassium and B vitamins like riboflavin, which increase the body’s overall energy levels, says Professor of Physiology at the University of Florida, Penelope Perkins-Veazie. Avocado doesn’t just look like testicle, it also contains high levels of folic acid, which helps metabolise proteins, thus giving you more energy. Reproduction specialist, George Brewer, notes that avocado also containsvitamin B6 (a nutrient that increases male hormone production) and potassium (which helps regulate a woman’s thyroid gland), two elements that help increase libido in both men and women. Nuts are a prime source of essential fatty acids. 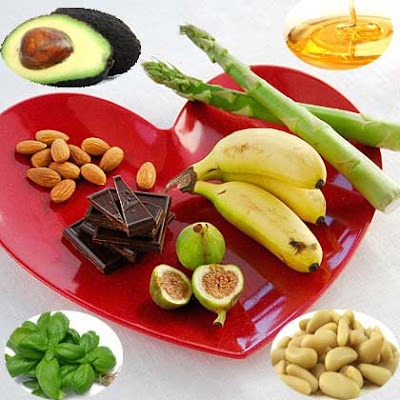 These are vital, as they provide the raw material for a man’s healthy production of hormones . A Professor of Medicine at Harvard Medical School and Boston University School of Medicine, Christos Mantzoros, says eggs are high in vitamins B6 and B5, which help to balance hormone levels and fight stress, two things that are crucial to a healthy libido. Eggs are also a symbol of fertility and rebirth. These are high in amino acids, which are believed to increase libido. Perkins-Veazie notes that they can also improve sexual stamina. Furthermore, the shape of a fresh fig and the sweet, juicy taste are two tangible aspects that are highly pleasurable to the human senses. Brewer says garlic contains allicin, an ingredient that increases blood flow to the sexual organs. As such, it’s a highly effective herb to help increase libido. You can take it in capsule form, or use it as food enhancer while cooking. Chocolate contains theobromine — an alkaloid that is very similar to caffeine. It also contains phenylethylamine, a chemical believed to produce the feeling of “being in love.” Experts add that dark chocolate has a massive amount of anti-oxidants, which are great for the body in general, as they help maintain the immune system. Nutritionists say salmon is a great source of the omega-3 fatty acids EPA and DHA that help maintain the fluidity of our cell membranes. Brewer says they keep our cardiovascular systems healthy by reducing inflammation, preventing excessive blood clotting, and keeping fats in the blood at healthy levels. The same omega-3 fats are also found in other fatty fish like tuna, black cod, halibut, and mackerel, nutritionists say. Watermelon is rich in a chemical called citrulline, which helps make nitric oxide that dilates blood vessels. It also contains the phytonutrient lycopene and beta-carotene, which act as antioxidants, protecting our cells. Fresh spinach and other green vegetables contain high amounts of chlorophyll, which purifies the blood and helps to increase blood flow. Some also contain essential fatty acids like omega 3 and 6. They’re a rich source of vitamins, including the fat-soluble A and K, and C, as well as minerals that keep the body rich in alkaline and improve energy levels.